The introduction of Saint Pierre Kuala Lumpur adds an extra sparkle to the already vibrant dining scene. It has rightfully claimed its merits as the first Michelin-starred fine dining restaurant to make its way to the city (aside from the shuttered Tim Ho Wan that pulled the plug from Malaysia in 2017). Keeping to its esteemed reputation in Singapore, Chef Emmanuel Stroobant carries over the same philosophy into its KL debut. In fact, Chef Stroobant is not new to the Malaysian dining scene – having a couple of TV cooking shows here which eventually led to discovering his passion for Asian-inspired elements. His talented team, headed by 27-year-old Luxembourg-born Chef KimKevin De Dood will uphold their Michelin-star cuisine and service as the Saint Pierre KL team strives to bring excellence and appease the most demanding food critics in town. Chef de Cuisine KimKevin De Dood. At present, diners will enjoy classic dishes from Saint Pierre’s classic menu including the Atlantic Cod with Miso, Oxtail and Roots, which is a 15-year-old recipe by Chef Stroobant himself. Chef De Dood reveals that he is currently working on new dishes, which will showcase his inspiration from the local exposure to Malaysian flavours. Minus the elaborate hype of W’s interiors, the corner walkway that leads into the restaurant’s main entrance is quite a welcoming (and peaceful) affair. Here, you can peel yourself away from the crowd especially with Saint Pierre KL being parallel to the lobby lounge of W Hotel Kuala Lumpur. Notice a gilded scalloped screen that curves into a veneered wall in herringbone finish – bearing the hallmark of the restaurant. The interior space flaunts a soothing plum colour, taking its cue from the purple tones of W’s communal space. A high ceiling and pared down seats make for an elegant setting overlooking the skyline. The ambience of this chic 70-seater dining space is elevated with an extravagant lighting installation depicting water droplets to further accentuate its height. Pick a seat (or one in the private dining area) and you’re ready to go. 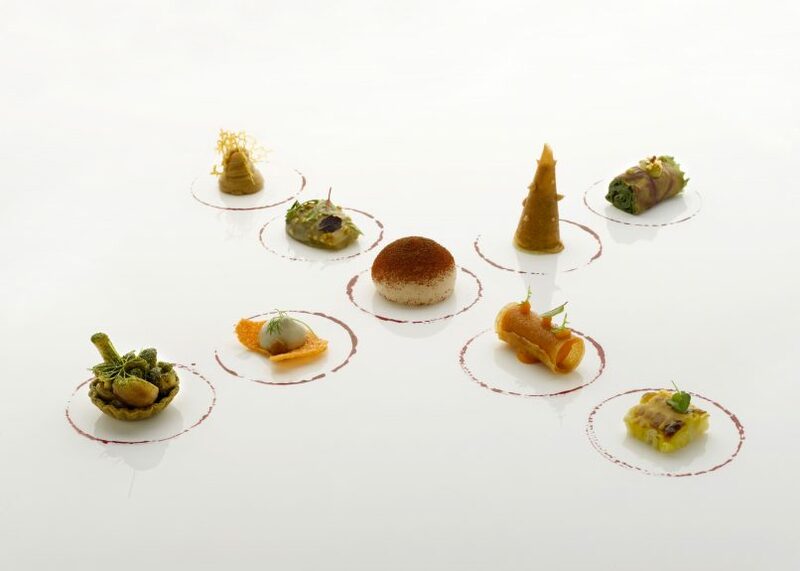 ‘Snacks’ comprises bite-sized amuse bouches to tantalise the palate. Saint Pierre KL offers lunch and dinner sets in multiple courses. For lunch, diners can select between a 3, 4 or 5-course at quite an affordable price. Its dinner menu varies from a 5 and 8-course menu to an exciting 12-course Adventure menu not for the faint-hearted. Start the 12-course menu with Snacks; a quintet of petite morsels comprising a tomato meringue with parmesan cream and basil; smoked salmon tartare with ikura in a cornette; crisp capsicum keropok with eggplant mayo and red miso; sweet corn with kefir lime oil; and baby eggplant with miso and sesame. Be sure to eat them in order as the sequence promises a journey that would be familiar, as you taste the rest of the dishes. Vegetarians will be delighted as there are plenty of meat-free renditions that are equally satiating as well. The Hass Avocado, Basil, Grapefruit and Sansho Pepper is a delightful avocado carpaccio served with dots of basil-infused avocado mousse, grapefruit segments and golden croutons. It is a clever and artsy take on the regular avocado toast, but with a refreshing zing. French Petit Violet Artichoke with turmeric and pine nut. Another standout is the Artichoke dish paired with turmeric and tamarind sauce – a warm touch to the dish. The French Petit Violet artichoke is stuffed with diced vegetables and pine nuts; dusted with pepper flakes to finish. The texture of the artichoke replaces the palate’s need for meat. It is little wonder why this dish is a hit in Singapore — it will change your mind about this humble vegetable. Brittany Blue Lobster dish is equally stunning. The subsequent dishes continue to impress especially if you’re someone who takes seafood seriously. Each dish features a main protein complemented with a certain Asian spice, herb or fruit. Take your pick: seared Hokkaido Scallop spiced with anise, served with fennel confit and curry oil, or Brittany Blue Lobster with wild mushrooms served with a Tom Ga Kai-inspired broth (ginger lends the heat) and fragranced with yuzu. Hokkaido Scallop with anise and curry oil. Perhaps, the chefs are not here to ‘try too hard’ to create bombastic flavours simply for the sake of novelty. Instead, the team adopts an honest and unpretentious way of cooking – which is quasi-French – but keeping it simple with a few main ingredients. Saint Pierre’s signature dishes also did not fail to impress especially the Ohmi Beef served with Yellow Chanterelles (seasonal French mushrooms) in a Nori tart shell. Expect an interesting earthy blend of seaweed and mushrooms with the perfect medium rare beef – umami at its best. Chef Stroobant’s 15-year-old recipe, miso-brushed Atlantic Cod in a bowl of flavour-packed oxtail consommé delights the palate. The hearty consommé is the liquid gold to this dish, especially when eaten with the succulent piece of fish. However, two dishes, in particular, fell short. The foie gras dish – perhaps the most inventive of the bunch – is a shock to the palate with two contrasting components that are rich and intense in equal parts. Diners get a huge portion of foie gras (which is great news for some) but when eaten together with the sweet concoction of lychee and apricot, the dish loses its balance. This lamb dish is also a signature at Saint Pierre KL. Another one that didn’t deliver is the Lamb dish. On the plate, it is no doubt the piece de resistance of the entire 12-course menu. The presentation hits the mark with creativity and interest, especially with a veil of green jelly disc covering the star of the dish. The vivid green and dark chocolate colour from the caramelised onions and curry reduction contrasts beautifully on a matte camel plate. But what the dish lacks is in the flavour as the curry is entirely overpowered by the savoury intensity of the jus. The yoghurt component, which is said to add an extra flavour profile to the dish, however further dilutes the spice and tang that the dish needed. Desserts, on the other hand, make up to the shortcomings of the rather heavy dishes. The Conference Pear with Parmesan and lime dessert, as well as Strawberries and Basil served in a meringue pot with mascarpone ice cream are both homeruns. Dig into the paper-thin tuile to discover textures of macerated strawberries and basil-infused mousse for a refreshing end to your dining experience. Don’t leave until the trolley of Petits Four is rolled out. Enjoy a wide selection of French desserts made in-house, including the quintessential macarons, tartes, chouquettes and petit gateaux – perfectly balance, not too sweet and worth every calorie count. It is in the finer details that make your dining experience at Saint Pierre a rather memorable one. In the watchful eyes of Chef De Dood, nothing bad will come out from the kitchen, as all guests will enjoy the remarkable excellence that goes with Chef Stroobant’s decade-long reputation. And for first-timers, it is best to start with the 5-course menu to sample your liking for what the restaurant has to offer. And with its menu evolving and adapting into the Malaysian environ, we are sure that the chefs are up for the challenge to create something different for local gourmands here.